← It’s all upside down (Apple Cake)! Sometimes things just don’t work out. Take this weekend for example. Plans were made, then an October snowstorm kind of put those plans to the test. 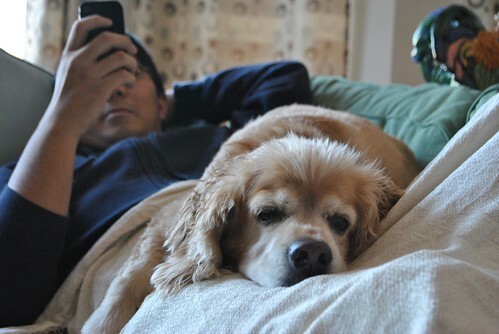 Ultimately everything got canceled and for the first weekend in many many moons, I hung out at home all weekend with nothing planned and nothing in my fridge. What does a girl do to pass some time? Bake of course. With the oven on, it will at least warm up the place without having to turn up the heat right? I haven’t made stuff out of a box since I started baking from scratch as a hobby. But right here, right now, snow bound and looking for something to bake with limited supplies, this mix was the answer. All I needed was my last stick of butter, two eggs and a cup of water. Done and done. Except of course I had to make some additions right? It called for a stick of melted butter. I browned a stick of butter and used some of it to grease my loaf pan. 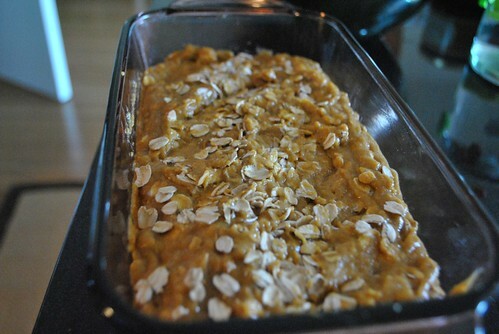 I also added a couple of handfuls of oats into the mix and a little on top. I mixed and poured into the pan and popped it into the oven for about an hour. Oopps! Mistakes happen...at least it was just the bottom! Once it finished, I took some leftover cream cheese my brother and father had gotten at the bagel store for their bagels, and put it in a bowl. I didn’t have any butter left, nor did I want to make a frosting. So to the cream cheese I added a couple of generous spoonfuls of the Pumpkin Pecan Butter and mixed until the butter was incorporated and the mixture was light. Pumpkin cream cheese, I guess. Together, it was good. The bread itself was too sweet for my taste. That’s one of my issues with pre made mixes, you can’t adjust the sugar or other ingredients to taste. But, it was easy, and the finished product was good. I’d recommend it for when you need something in a pinch, but have an hour to bake it. 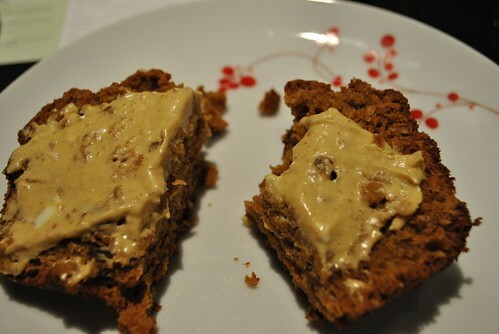 The addition of the oats gave it a nice texture, perhaps I would add more next time. 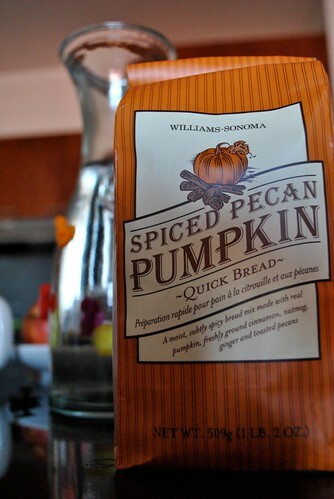 The pumpkin cream cheese was good. Light, not too sweet and deliciously creamy like a whipped cream cheese. It goes great on anything really. 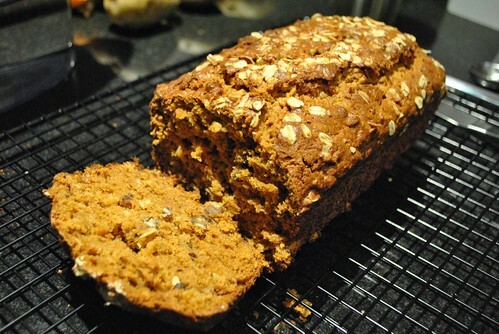 This entry was posted in Bread and tagged Mix, Pumpkin, Quickbread. Bookmark the permalink. 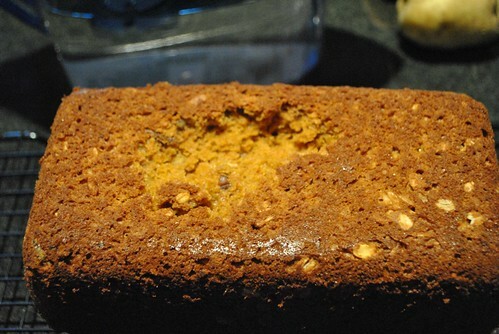 William Sonoma is out of the recipe cards for the Ooey Gooey Pumpkin bars and does not have the recipe online. Would you be so kind to post it? Thank you. Preheat oven to 350degF, grease a 13×9″ baking pan. 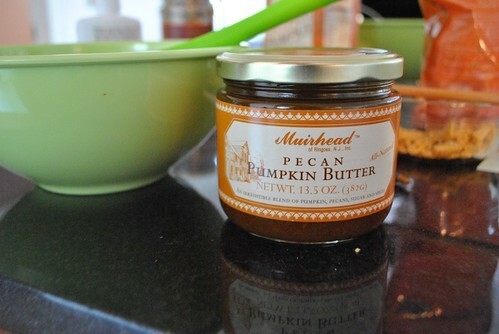 Filling: In bowl, combine 8oz cream cheese, 1 jar WS Muir Pecan Pumpkin Butter and beat on med till smooth (1min). 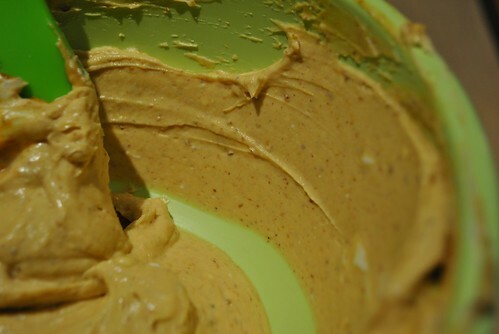 Add 3 eggs, 1tsp vanilla extract, 8tbs melted unsalted butter and 1/2 tsp cinnamon. Beat till combined (2 min). Add 15oz confectioners sugar and beat another 2 min. Assemble: Spread filling over crust. Put into oven and bake for 40-50 min (Don’t overbake). It should still be a little gooey in the middle and with a gentle shake of the pan, the middle should have a slight jiggle. Put pan on wire rack to cool for at least 20 minutes. Cut into bars (about 16).